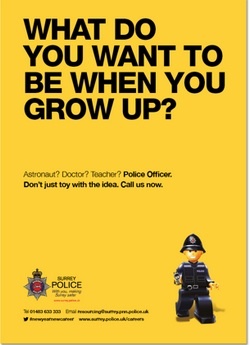 Delivering Surrey Police’s recruitment advertising campaign – with Design Inc it’s child’s play! We are pleased to report some amazing statistics from our recent ‘What do you want to be when you grow-up?’ recruitment advertising campaign for Surrey Police. In terms of increase in numbers of applicants, we saw a rise of an astonishing 6500% of this campaign over the previous year’s version. That would make an impressive percentage for anyone to quote in an interview. The striking black and yellow headline is supported by the presence of 3 different toy figure characters, which were drawn from scratch to resemble Lego characters, and representing male, female and ethnic diversity in police officer recruitment. The campaign was specifically designed to capture the imagination of ‘children of all ages’ to promote the fact that a career with Surrey Police is a truly grown-up role. The campaign saw advertising within a number of local publications, as interior and exterior bus posters, bus stop shelters. Moreover, large format posters were printed and published at a number of Surrey train stations. The campaign also included the development of Information Packs for applicants – including a branded typographic treatment of all the ‘unofficial’ roles a police officer can end up fulfilling in the community. Since the campaign broke, social media has also been alive with people who have seen the posters and passed on viral comments on the recruitment advertising campaign including some parody character versions. All good publicity!